Reliance Jio has become quite popular with their tariff plans and the company keep giving offers to their users. The overall growth of this network is increased in a very short amount compared to other networks. Today, Reliance Jio announced its new Dhan Dhana Dhan tariff plans. The new plans with revised benefits will be available from October 19 and can be availed by new as well as existing Jio subscribers. The latest entrant in India's telecom sector has increased the rate of its popular 84-day Rs. 399 Dhan Dhana Dhan plan to Rs. 459 from Thursday, under which subscribers get 1GB 4G data per day, according to information published on the company's website. The Mukesh Ambani-led company however said that subscribers of its Rs. 149 plan will get double the amount of high speed data 4 GB of data for each billing cycle of 28 days under the new scheme "Diwali Dhamaka" compared to 2GB being offered at present. Reliance Jio's Rs. 399 "Diwali Dhan Dhana Dhan" plan gives users eight coupons of Rs. 50. This translates into a complete cashback of the recharge amount. However, these eight coupons of Rs. 50 can only be redeemed after November 15 on a recharge of Rs. 309 or higher denomination pack. The last day to avail the Rs. 399 plan is October 18, 2017, Reliance Jio's website said. 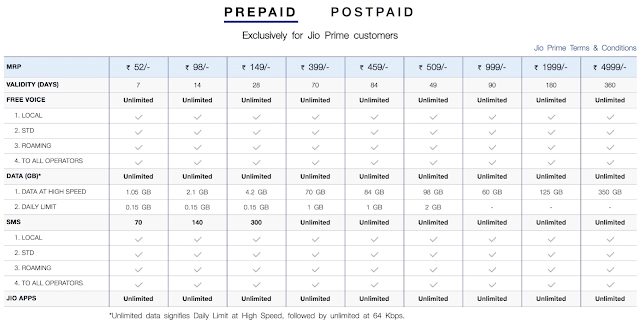 The new Jio 459 plan will provide users with 1GB of high-speed data per day for 84 days, along with free calls and bundled SMS like the earlier Rs. 399 plan. Jio has also reduced recharge tariff for lower denomination and short-term plans besides offering data benefits under the schemes. Jio has introduced plan for Rs. 52 with one-week validity and Rs. 98 with two weeks that will offer its customers free voice, SMS, unlimited data (0.15 GB daily), as per its website. All plans of Jio will continue to offer unlimited voice calls even during roaming. 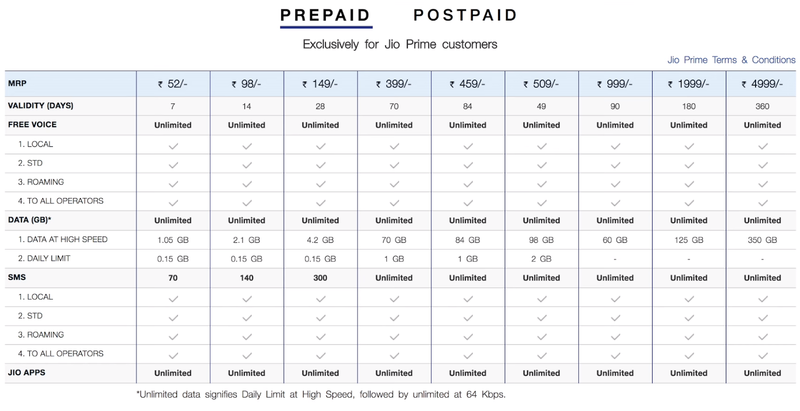 Under the tariff revision, Jio has also doubled the amount of data bundled with the Rs. 149 prepaid pack from 2GB per day to 4GB per day. The company has also reduced benefit under Rs. 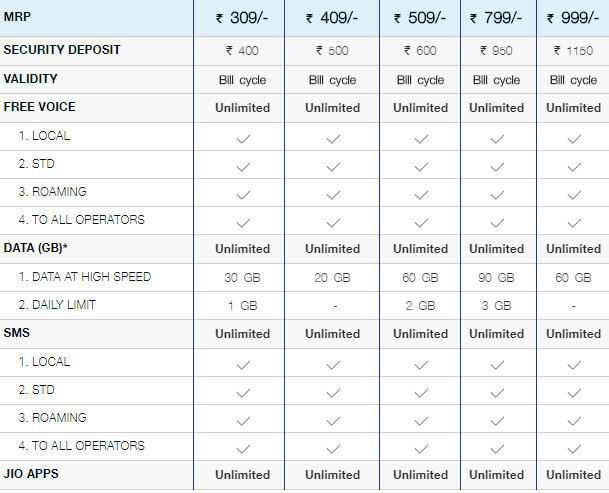 509 scheme, which offers 2GB of data per day, by reducing its validity or billing cycle from 56 days to 49. Accordingly, data at high speed gets reduced to 98 GB from 112 GB under previous scheme. Under this plan, data cost will be Rs. 5.2 per GB. The Rs. 999 plan which offered 90GB of 4G data without cut in download speed will now offer 60GB high speed data for three months. Jio has introduced Rs. 1,999 plan which will have six months validity and offer 125GB data at unrestricted high speed. Under the new scheme, the validity of plan priced at Rs. 4,999 will be for a year instead of 210 days under the previous scheme. However, customers opting for it will get unrestricted access to 350 GB high speed data for the plan period compared to 380 GB offered earlier for same price. Post paid plans have also been revised that now get only 1 month validity and less data. Check out the list below. Let us know which plan you are going to choose and are you happy with this change?